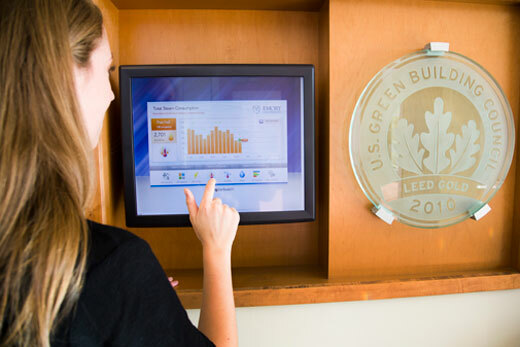 Emory surpassed its former energy reduction goal by establishing energy efficiency projects, a building temperature policy, a predictive maintenance program to keep high performance buildings running efficiently and other initiatives that are implemented year-round. In the fall semester, Campus Services and the Office of Sustainability Initiatives (OSI) partner for two other programs with measurable energy reduction: the Campus Energy Competition and the Holiday Building Turndown. Throughout October, all Atlanta campus buildings and the Oxford campus residence halls competed in the annual Energy Competition. All buildings in three categories — residential, academic and administrative, and research and clinic — compete to achieve the most energy use reduction during this October compared to last October. This year’s Energy Competition winners for Emory’s Atlanta campus are the Emory Clinic Building A (research and clinic) with a 29 percent decrease in energy consumption, equating to 125,860 saved kilowatt hours; the North Decatur Building (academic and administrative) with a 14 percent energy use reduction, totaling to a 92,000 kilowatt hour reduction; and Alabama Hall (residence hall) with 23 percent energy reduction, or 3,000 kilowatt hours. Emory’s Oxford residence hall winner is Fleming Hall with a 1.1 percent decrease from 2016 energy usage levels. The campus saved 819,701 kilowatt hours from last October, which is equivalent of 610 metric tons of carbon dioxide avoided. The reduction is equal to taking 130 cars off the road for a year or diverting almost 215 tons of garbage from a landfill. Consistent with energy reduction efforts over the past several years, over the two periods of official university winter holidays, Dec. 23-26 and Dec. 29-Jan. 1, Emory plans to program the heating systems in many Atlanta campus buildings to maintain a 55° F minimum set point which will reduce energy costs while still protecting building contents. The heat will be turned back up early enough on Dec. 27 and Jan. 2 to ensure a comfortable work environment. In past years, energy reduction from the turndown has resulted in around $40,000 in savings for the campus. For buildings not participating in the Holiday Building Turndown, occupants are reminded to ensure thermostats are locally set to 68° F or the lowest setting. Building occupants are also asked to turn off interior lights, computers and other office equipment before leaving for the holidays.